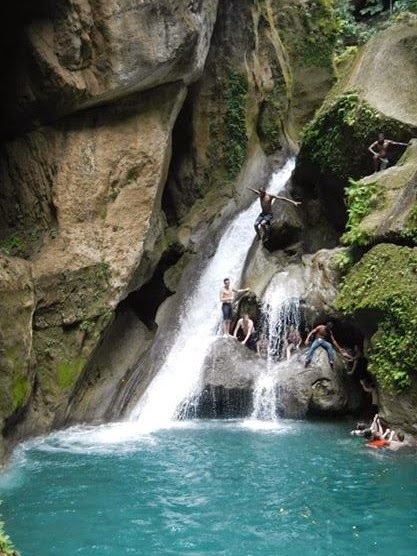 I have been gunning to visit Bassin Bleu in Jacmel since I got to Haiti last summer and, after having worked with a youth group from Minnesota who was staying at the school for a week, they invited me to join them on their great adventure. Approach an edge where you are told to take off your shoes and hold on tight. When you emerge from your dive, you see this. It was an incredible, incredible day in this beautiful country that I live in. Oh, and in case you need a laugh, here is Rigan, an FSIL grad who came with us, bedecked in Packers gear and playing with my ukulele over some stunning vistas. Rigan runs a clinic in a very rural part of Haiti relatively near Leogane and is the sole healthcare provider for thousands of people.